Horse & Brenna, originally uploaded by FAUX_REAL. Herewith the first in a continuing series on horse colour. There are a lot of misconceptions, myths and general BS on the subject, which is criminal when there is so much good information available. 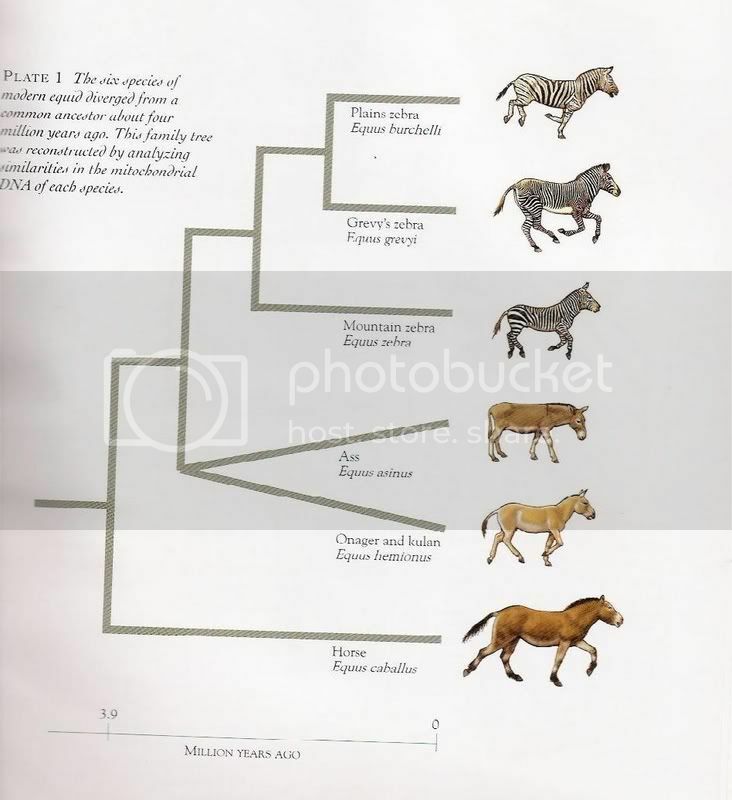 To begin at the beginning…All horses have one of two possible base colours: black and red (chestnut). Every other possible colour, pattern, combination and permutation builds on these. Every horse receives one gene from each parent. Black is dominant to red; if a horse has one black gene and one red gene, it will be a black-based colour. We know that the chestnut in the picture above received one red from the sire and another from the dam. The black horse may have gotten two black genes, or one red and one black. A horse with two copies of a gene is homozygous for that gene, meaning it will always pass it on. Chestnuts can vary in colour from almost palomino, to red, to dark brown, to nearly black. The latter shade is particularly common in Morgans. Chestnut crossed on chestnut will always give chestnut; no exceptions. The first and most common modifier is agouti. Agouti turns a black horse into a bay or brown by restricting the black to the “points” of the horse. Think of agouti as pulling the black to the margins of the horse, so to speak, letting the red show through; thus, the red or brown body. French researchers found that brown horses (called black bay in some breeds) tested positive for the agouti gene; it may be that this is a weaker form of agouti which doesn’t pull the black back as far, so to speak, so that the red only shows through on the muzzles and flanks of the horse. Brown foals are usually very bay-looking at birth, then shed off to reveal the darker colour underneath. 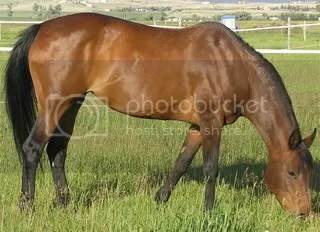 There is also a rare form of bay called wild bay, in which the black on the legs is restricted to low “anklets”; the horse might look like a dark-maned chestnut at first glance, although it is genetically bay. You can see a few examples here. Red factor and agouti can be detected through genetic testing. A red horse can carry agouti, but not express it (because there is no black body pigment for it to act on); it could still pass it on. 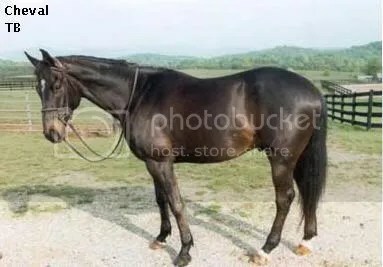 Our horse in the picture may have had a bay parent (which passed on the red but no black) and received an agouti gene from that parent; we just can’t see it. If our agouti-carrying chestnut were bred to a black, then bay would be possible. Great info! So tell me where a dun/buckskin comes in? A fjord sire (dun) and a buckskin qh/arab dam – creating a very diluted ivory (shines silver and gold in the sunlight) buckskin (dun?). Does this come under the creme gene? Dunskin = black + agouti + dun + cream. Is this a real horse you’re discussing, and if so, does it have that cool Fjord mane? A great website I have found is a color calculator from Animal Genetics, Inc.
You can enter dam and sire color along with any other factors such as agouti or homozygous and it will tell you what colors the foal can be. I recently came across some horse colours I’ve never heard of and am still trying to develop a better understanding the complicated genetics related to horse colour. I look forward to further articles on this subject.